WØEA Blog! : Are we having FUN yet?! This weekend was the annual CW Fun event. This is an interesting event where operators exchange 5 letter "code words" in addition to the standard signal report, QTH, and name. There were some 150 people signed up for the event and I made a few contacts here and there, but I did not really devote much time to it. This one is going on the calendar for next year for sure! 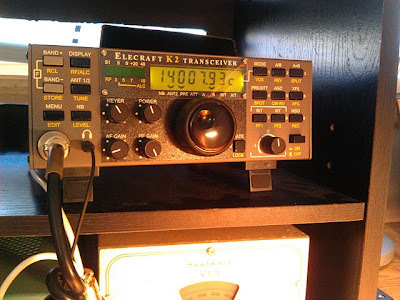 On Saturday I received some parts from Alex, K5UNY, for my recently acquired Heathkit VF-1. The goal was to modify the circuitry to allow the VFO to be keyed by the HW-16 using grid-block keying. The modification is easy enough to do if one follows the DX-60 manual - it only amounts to clipping a couple leads, installing a capacitor and one jumper wire. Unfortunately, even with the simple mod, it seems to not quite be working. I am able to key the rig by turning the VFO to the ON position but the output of the VFO is not there. The circuit is so darn simple so I should be able to figure out what is going on. Thats on the plate! I'm not sure how exactly this antenna works, but it sure does work! Finally, on the way back from picking up the parts for the G-H antenna, I stopped at Radio Shack because I found something on their website I thought I could use - a pair of "flip-up" feet made for propping up laptops to improve air flow. I figured these would make excellent feet for a rig. My K2's bail is very tall and while Elecraft has a shorter bail available, I still don't care for the way the bail looks - yeah I'm a bit of a perfectionist... The flip-up feet have 2 choices of heights and attach by just peel and stick foam adhesive on the back. Think that is all for this week! Bands are picking up, best DX to everybody!